The Lions will be looking for their first MCG win since 2014 when they face Essendon on Saturday. 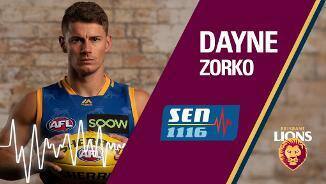 Dayne Zorko joins the podcast following his contract extension announcement. 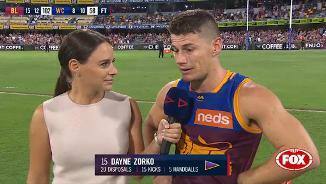 A quick and gutsy midfielder, Dayne Zorko dominated the local Queensland competition for a number of years before getting his chance at an AFL career. He has since made an immediate impact at the elite level, displaying the pace, skill and determination to run through the middle, or even provide an effective small forward option. • Originally from Surfers Paradise, Zorko Captained Queensland's U18 side in 2007, but was overlooked at the AFL National Draft. • He joined Broadbeach's senior QAFL side as an 18 year-old and made an immediate impact with the Cats by winning the Club's Best & Fairest award. • He went on to win four successive Broadbeach Best & Fairest awards and Captain Queensland's U21 side - but repeatedly failed in his attempt to find his way onto an AFL list. • But an outstanding season in the NEAFL, which culminated in him winning the 2011 Syd Guildford Trophy as the Football Record Player of the Year, put Zorko back on the AFL recruiters' radar. • Arguably most significant was his brilliant four-goal performance in Queensland’s narrow loss to Western Australia which also netted him the Zane Taylor Medal as best afield. • He also finished just one vote shy of securing the 2011 Grogan Medal - which incidentally, was his third top 10 finish in the competition's highest individual honour across the past four seasons. • Zorko was eventually snapped up by the Gold Coast SUNS as a Queensland Priority Selection, before then being on-traded to the Brisbane Lions in exchange for Pick No.34 in the 2011 AFL National Draft. • Zorko played 21 games in 2017 and kicked 35 goals. • Averaged just over 25 disposals per match. • Collected 36 disposals and kicked four goals in a huge performance against Geelong in Round 16. • His stunning season was rewarded with the Merrett-Murray Medal at the Lions’ Club Champion award for the third consecutive year, while he also gained All-Australian selection for the first time. • Zorko played 20 games in 2016 and celebrated his 100th match in Round 22 - he averaged 23.6 disposals this season, including a season high 33 touches against Sydney. • He kicked four goals in the Lions’ big loss to Collingwood in Round 8, and played one of the best halves seen by a Brisbane Lions player in recent seasons against Carlton in Round 21. • Zorko was the architect of the Lions’ four-point win with a superb individual display. He finished with 27 touches, three goals, 12 inside 50s, five scoring assists and 12 contested possessions. 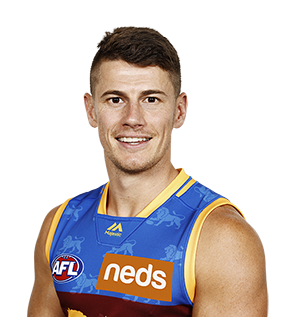 • Dayne Zorko’s terrific season was rewarded with the Merrett-Murray Medal at the Lions’ Club Champion awards - the second time he won the Club's Fairest and Best award, after being one of four Merrett-Murray medallists in 2015. • Zorko’s form in the back half of the season was exceptional, earning him his first Merrett-Murray Medal at the 2015 Club Champion awards night. • The Queenslander racked up a game high 38 possessions against Adelaide, attributing a move further up the ground to getting the most out of his football. • Across the season he averaged a career-best 22.95 disposals per game but wasn’t able to match his goal tally from 2013 (26), finishing the season with 18 goals. • After the official AFl player ratings showed Dayne Zorko to be the most improved player in 2013, he signed a new deal with the Lions, keeping him at Brisbane until the end of 2016. • Zorko stepped up again in the 2014 season, playing some career best games while averaging 22.2 disposals. • In a disappointing loss to Fremantle in round 22, Zorko demonstrated his never give up attitude, raking up 38 disposals (15 kicks 23 hand balls), 7 marks and 5 tackles. • Following his outstanding season, Zorko placed 2nd in the Club’s Merrett-Murray medal with 134 votes just short of winner Tom Rockliff on 138. • Fresh from a standout debut season, Zorko showed no signs of the 'second year blues' when he produced a standout NAB Cup campaign. Not only did he help guide the Lions to a breakthrough pre-season premiership, but he also nearly claimed the Michael Tuck Medal as the best on ground in the Grand Final triumph over Carlton (he was eventually edged out by teammate Daniel Rich). • He went on to play in all 22 of the Lions' senior matches in 2013 (one of only four players to do so) and kick the second most goals at the Club (26) - just two shy of Jonathan Brown. • Although his scoreboard impact was far greater in 2013, Zorko's average number of possessions, tackles and inside 50s dropped from his stellar debut season. • He still produced some big individual efforts, including a 29-disposal and three-goal performance against Melbourne in Round 5 at the Gabba. • His value to the team was rewarded when he finished equal 4th in the Club Champion award alongside Tom Rockliff - bettering his equal 7th position from his debut year. • Zorko was also named in Queensland's Team of the Year for the second consecutive season. 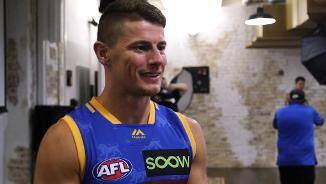 • Zorko’s first ever AFL pre-season was hampered by a hip flexor injury which required the 23-year-old to travel to Perth for treatment, before pulling on the Lions colours for the first time in Round 5 for the Reserves. • After two dominant displays in the NEAFL to build his match fitness, Zorko was rewarded with a senior berth against Collingwood in Round 7 – and the rest is history. • After starting as the substitute against Collingwood, Zorko kicked his first goal against GWS in Round 8. • But it was his performances in the next four weeks, where he averaged 21 possessions, laid 30 tackles and kicked five goals, that really made the AFL community sit up and take notice. • Zorko went on to become a cult figure among fans, teammates and the media alike – with respected commentators Dennis Cometti and Brian Taylor dubbing him “Zorko the Magician” and “The Zork” within just a few games. • Rarely has a first-year player been so influential, with coach Michael Voss describing him as “a player that lifts the rest of the team”. • He played a total of 16 games in 2012, with an average 20 disposals, an average 6 tackles (second only to Jack Redden at the Club), and a total of 16 goals for the year. • Zorko’s achievement was so great that when it came time to award the Rookie of the Year award at the annual Club Champion Dinner, the match committee sought board approval so that Zorko (who, under the original rules was too young to win the award at age 23), could claim the award that he so thoroughly deserved. • He also finished the year with a remarkable 6 Brownlow Votes – the Club’s equal second with Simon Black and Jack Redden.